Sydney Shop Girl: Dr Ruth Galloway. Life Lately, Before and After This Cold. Dr Ruth Galloway. Life Lately, Before and After This Cold. These are glamorous and exciting times at SSG Manor 2.0. I've caught myself a cold and have had to feed myself one lemonade icy pole six hourly to soothe the scratchy situation that is my throat. Unfortunately it's all pain and no gain this time around. My voice just sounds distorted rather than whisky and cigarette raspy. Is whisky even the alcohol that adds timbre to your voice? Anyway. I've abandoned perfume and instead waft Vicks wherever I wander. Don't get me started on the baggy mum jeans and tatty old jumper I've been wearing for the judgement of the general public. I also have a new crime series passion. 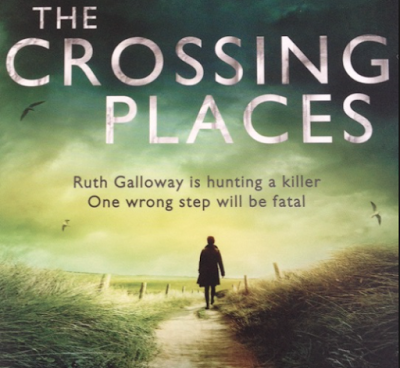 'The Crossing Places' is the first in British crime author Elly Griffiths' (the pseudonym that Domenica de Rosa writes under) series featuring Dr Ruth Galloway. Dr Galloway is a just turned 40 archaeologist and university lecturer who just happens to be both single (she ended it with a man recently and he married someone else six months later before becoming a dad, they still keep in touch) and a lover of cats. Ruth lives in a remote marshland near Norfolk. It's a part of the world that holds many of the secrets of past civilisations in its boggy depths. But it's not just the deaths, rituals and murders of the past that Ruth encounters in 'The Crossing Places', she also gets involved in the murder investigations involving two young girls who have been abducted and presumed dead within the last decade in the Saltmarsh area. Ruth Galloway is not the kind of woman who immediately springs to mind when you think pivotal character around whom to create a mystery series. For me, this is a huge part of her appeal. Ruth is quite content living on her own with her cats. She has some great male friends and she has some great female friends. They're all mostly in relationships and Ruth often finds herself analysing the various dynamics from afar. She has some notion that it might be a bit late to start a family (of human babies) at forty but she's not that upset about it. She leaves that to her mother. Dr Galloway, quite simply, loves her career, her life and the home she's made for her cats and herself in a pretty inhospitable corner of the world. She just happens to have found herself in the middle of a murder investigation and a web of secrets weaved by her friends. It's early days yet but it also looks like she might have inadvertently found herself a few suitors in the process as well. What's not to love when Elly Griffiths brings into Ruth's world a bit of finely plotted suspense? I was getting a little sad at the realisation that my Louise Penny library was rapidly coming to an end but this new Elly Griffiths door has just opened for me and it looks like I'll have a full reading list for the next school holidays. I'm thinking positive and hoping that my eyes won't still be burning from this cold for my next day back at work. I've got some L'Oreal Infallible wind up eyeliners to debut because I've finally accepted that while my Sephora ones performed brilliantly, they also irritated my eyes like you wouldn't believe if any stray bits ended up in my eyes. I've never had problems like this with other brands so I hope it was just this one time with the one particular brand of eyeliner and not a permanent problem because heaven knows, I need a bit of tightlining to look presentable for work. 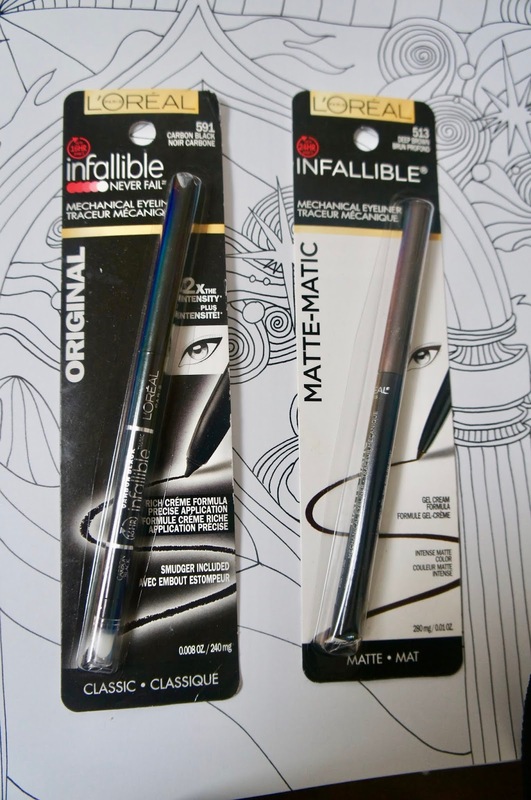 Unfortunately, I don't think these Infallible eyeliners are available in Australia. I got mine at Target it LA earlier this year. If all goes well with them, I'll definitely be making plans to stock up on my next trip the US. 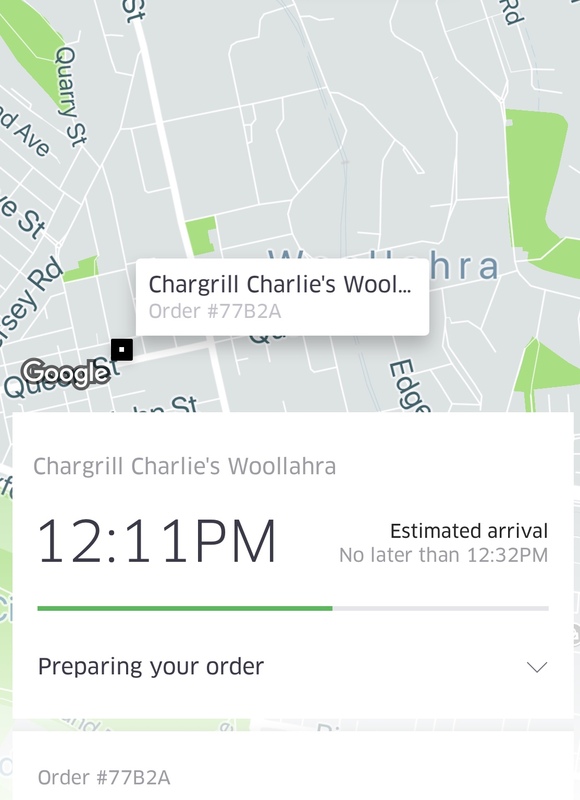 In anticipation of that next trip, I revised the procedure for ordering UberEats over the weekend. 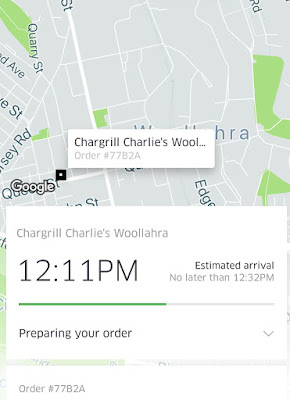 How good is it being able to have Chargrill Charlies for Sunday lunch but not having to battle the crowd in store? Capital 'G' good to be honest. I'm on a roll with the exciting content today so why stop with my final photo? 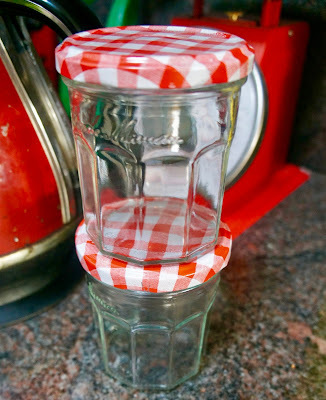 Isn't it a satisfying moment when you empty the dishwasher and find that you have new Bonne Marie jam jars freshly upcycled (my dishwasher even removes the label and leaves it for you in one piece to remove from the top rack) and ready to store a batch of salad dressing or similar? I hope you start to feel better! Gargle with warm salt water. I love my Bonne Marie jars. I think it's the cheerful red checks. I have about 5 that's taken me years to collect. I use them for a lot of things as I like to make much of my food myself. Mayonnaise, salad dressings and home made ghee. I have given up sugar, and my husband does not partake in jams, so I might need to buy a jar and donate the jam to my son and his family if I need a new container. I hope you feel better soon SSG! I am hoping we can have a fairly sickness free winter but we will see how it goes - already in one of our offices they have been hit badly with flu, and we are getting the warnings around about making sure to stay home when we are sick. Apparently, a few weeks before I returned from maternity leave last year, our local office was at 50% maximum as everyone at some point had caught the flu and they are wanting to avoid a repeat! Fingers crossed for a speedy recovery for you, and for nothing more serious to come your way, a cold when you're a mum is bad enough!